A mild romance wrapped in an anti-authoritarian message, The Electric Horseman is a rather tepid third teaming of Robert Redford and Jane Fonda. The film makes its point early, and then struggles to find much momentum on the way to an obviously contrived scenario of opposites attracting. Retired former rodeo champion Sonny Steele (Redford) is the national spokesperson and commercial face for a breakfast cereal peddled by a major corporation. To cash his cheque, Sonny has to stay sober enough to briefly ride a horse around in circles at country fairs, dressed in a hideous outfit featuring strings of lights. The CEO (John Saxon) has grander plans to expand market share by using the thoroughbred horse Rising Star as another company selling point. At a corporate convention in Las Vegas to unveil the horse to the gathered media, Steele discovers that Rising Star is being mistreated and injected full of drugs. He decides to free the horse from its fate, and causes a stir by riding away on the Strip and into the desert. With the authorities desperately looking for Steele and the precious horse, television reporter Hallie Martin (Fonda) is the first to track him down and get his story. The Electric Horseman takes plenty of shots at corporations milking celebrities to peddle product, and delivers an equal number of insults to has-beens who prolong their earnings by accepting endorsement cheques from the highest bidders. The anti-corporate message is the focus of the first half, but only a back-drop for the second half, which settles into standard romance fare between the simpleton cowboy with a cause and the urbane reporter seeking a story. Of course they start off as adversaries with nothing in common and plenty of fabricated tension, but gradually she falls for his spell. Fonda essentially repeats her television reporter role from The China Syndrome, her other 1979 film. But rather than uncovering a dangerous conspiracy that could unleash a nuclear disaster, in The Electric Horseman she tracks down an ageing cowboy determined to set a horse free. For the Fonda persona, it's an obvious downgrade in reporter assignments, but this does not prevent Fonda from munching into the role with the steadfast belief that the world should care deeply about one overpriced horse and a washed up cowboy. 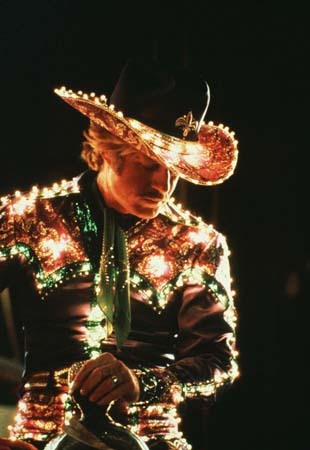 Redford fares better as Sonny Steele, an early recruit into the ranks of corporate sell-outs. The problem with Steele is that he is all too aware that he has sold out, and is more than ready to drown his sorrow in the bottle. But whereas he does not mind his name becoming a joke, he draws the line at a thoroughbred horse having to suffer the ignominy of representing corporate greed. Redford finds the edge where a former champion wakes up from his slumber to champion a new cause, and combines the rough with the well-meaning to overcome his adversaries with wit and wisdom. Director Sydney Pollack and cinematographer Owen Roizman make the most out of a Las Vegas that hosts sleazy suits and their slick profit motives, and they excel in capturing the scenic countryside as Sonny and Hallie make their way to the canyon where Rising Star is to be released. Most of the second half of The Electric Horseman is a walk-and-ride slow journey through attractive scenery, allowing plenty of time for romance to blossom, and the film at least looks good as it kills the time with not much really happening. Valerie Perrine as Sonny's ex-wife, Wilford Brimley as a rancher who helps Sonny escape, and Willie Nelson as an old and eccentric friend make spot appearances and add some colour. The Electric Horseman is comfortable in its predictability, harmlessly vanilla in its delivery, and with just enough star power to keep the horse amblin' along.